Jenkintown adopts a long-range plan that tip-toes around issues it needs to address head on. Last week, after five years of discussion, Jenkintown Borough Council formally adopted the Jenkintown 2035 plan. After a half a decade of notes, presentations, debates, and fact finding, the fact that no one involved with the plan — except for someone from the county — witnessed the vote came as quite the anti-climax. The plan paints a lovely future for Jenkintown. It looks to a thriving commercial district, preserved historic housing, and enhanced transportation options among other other things. As these plans are typically the result of consensus, a reader will find almost nothing controversial in there. I’ve come to the point in my life where I think municipal comprehensive planning is worthless. More often than not, it is a mechanism to wrap a veneer of legitimacy around the large policy objectives of influential people. Most cities would be better off putting together a good vision statement and a set of guiding principles for making decisions, then getting on with it. 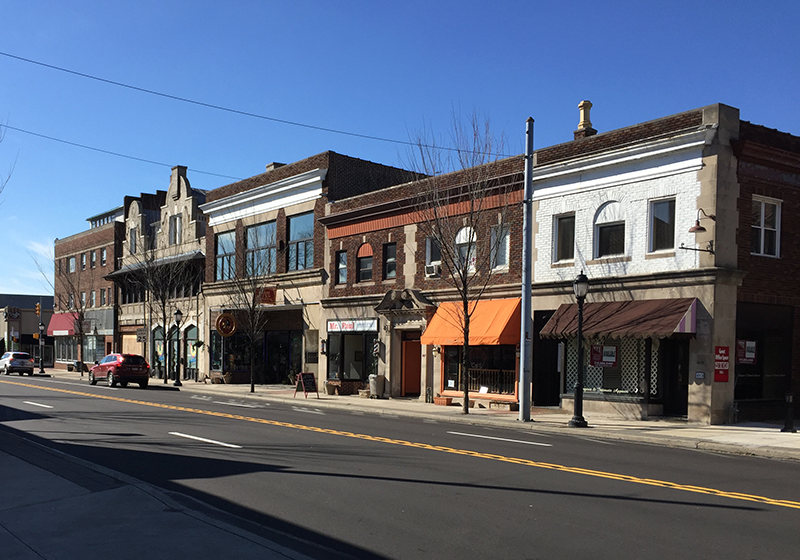 The plan is well-meaning and could provide a blueprint for Jenkintown, but only if the Borough puts someone qualified in place to steward it. As best we can tell, that person does not currently have a desk in Borough Hall. Here’s just a few things that the plan failed to address or got wrong. Artist rendering of a future Jenkintown where people sip coffee in busy intersections. York Road, York Road, YORK ROAD! Jenkintown’s core will never truly revive until York Road is put on a traffic diet. We hammer on this point all the time, but it’s true. Everything must begin from there. Until that happens, the only developers interested in bringing anything major to the town will be auto-oriented. You simply cannot get a critical mass of foot traffic unless you create more pedestrian-oriented commercial space, and you can’t do that until York Road is tamed. Wholesale district development. There should be some major incentive or marketing push for a wholesale redevelopment of the area between Cherry and Cloverly. Right now that rag-tag bunch of mostly nondescript, auto-oriented buildings are doing no one any good, least of all the community. Apples to oranges comparisons. The plan cited in inventory of over a million square feet of commercial space in Jenkintown and then went on to compare that favorably to Center City and Fort Washington. Really? In comparison to those places, how much class A commercial space, office and retail, do we have in comparison? By my reckoning, it’s tiny, and outside of the buildings by the train station and the old Strawbridge building, next to zero. Sadly, Jenkintown’s office and retail inventory is largely obsolete. Much of this would be addressed by the preceding point. Streetscape. I find it odd and more than a little aggravating that the plan talked mostly about commercial streetscape. Company heads and entrepreneurs typically prefer to set up businesses where they like to live, and what improves the look of a residential streetscape? Great, well-engineered and well maintained sidewalks. You make a town a great place to live, and all else follows, and if you remove the burden of sidewalk repair from individual households and make it a wholesale program, you get more and pay less. There is simply no argument against that. In simple terms, the plan does not think big enough. For such a small town like Jenkintown to survive, it must add density. It must do whatever it can to get more people to settle and work here, not fewer — and that includes bringing in more children. The whole Summit Hill issue exposed a rather unsavory attitude some residents had about the prospect of more kids in the school system. Sorry to have to tell them that this is not and should be a gated community. For Jenkintown to survive as an independent entity, it needs to add density, not disperse it. I know there’s a mindset that wants to fight that, but there’s no denying the economics of it.